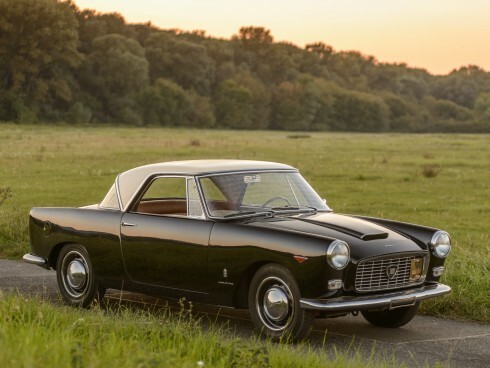 Over its 86 years of business and counting, the Italian design firm, Pininfarina, has archived what many argue as the most beautiful catalogue of automobiles in history. 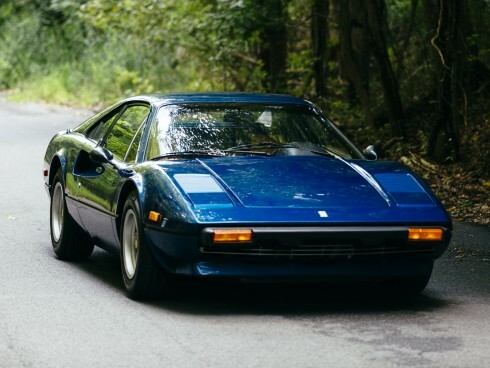 From Ferraris to Maseratis, Lancias to Fiats, the coachbuilders at Pininfarina have penned and constructed an incredible cache of timeless lust worthy machines for many of the world’s greatest manufacturers. 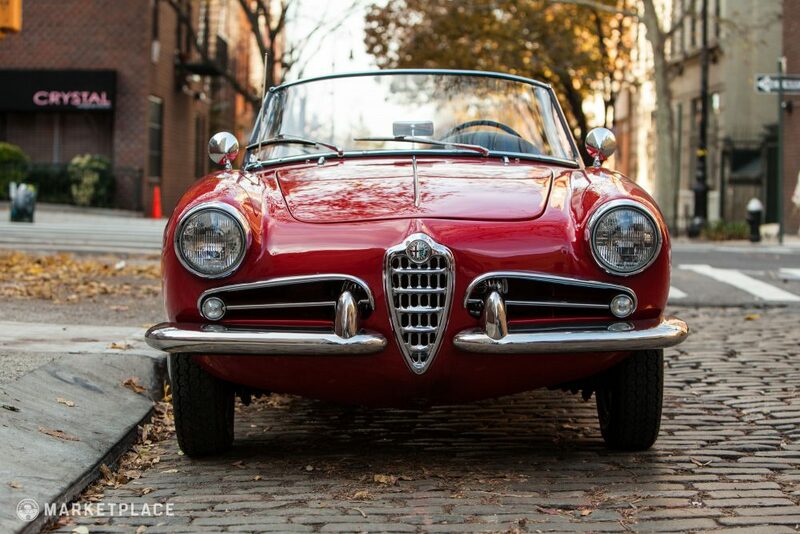 It’s no surprise that their synergy with Alfa Romeo resulted in some of the most coveted shapes of all time. 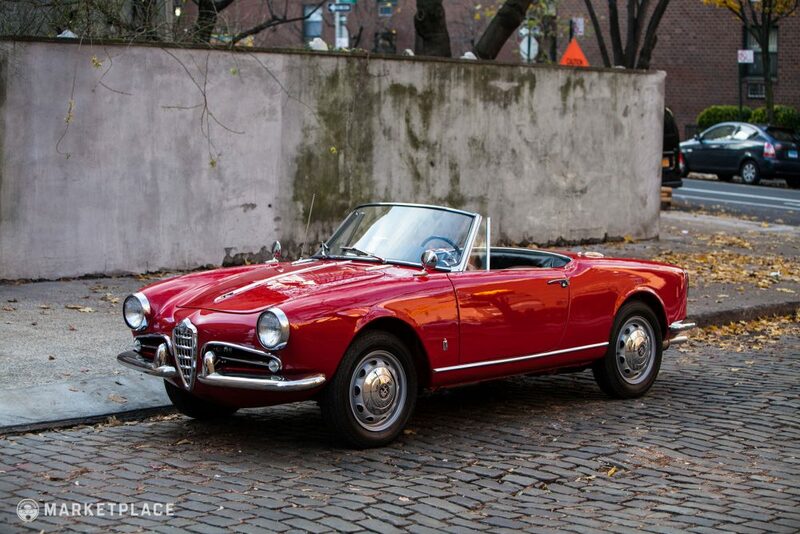 Of their more notable collaborations was the little Alfa Romeo Giulietta Spider Veloce. 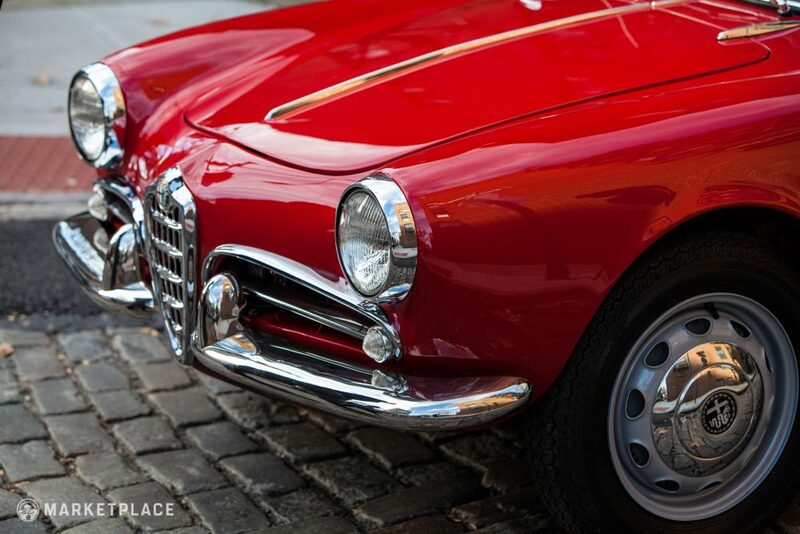 At the 1954 Turin Motor Show, Alfa Romeo debuted its newest two-plus-two sports coupe, the Giulietta Sprint. 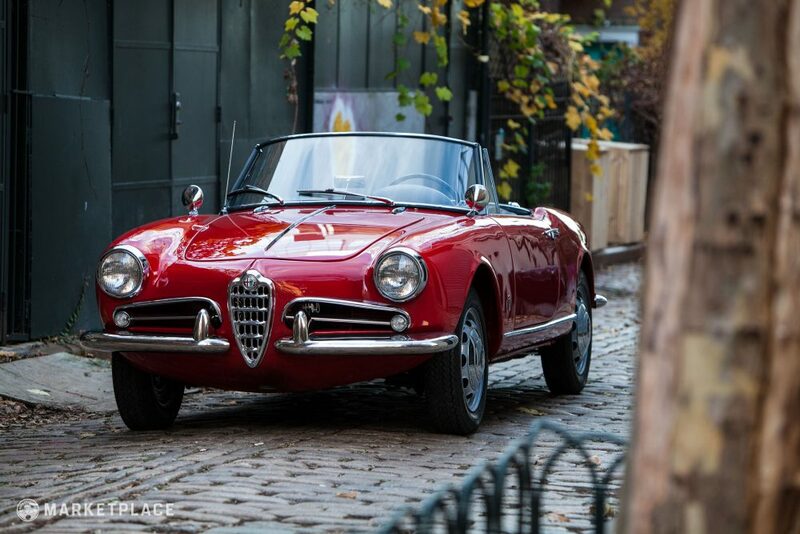 Originally designed by Franco Scaglione at Bertone, by 1955 Alfa wanted to add a convertible version of the Giulietta Sprint. 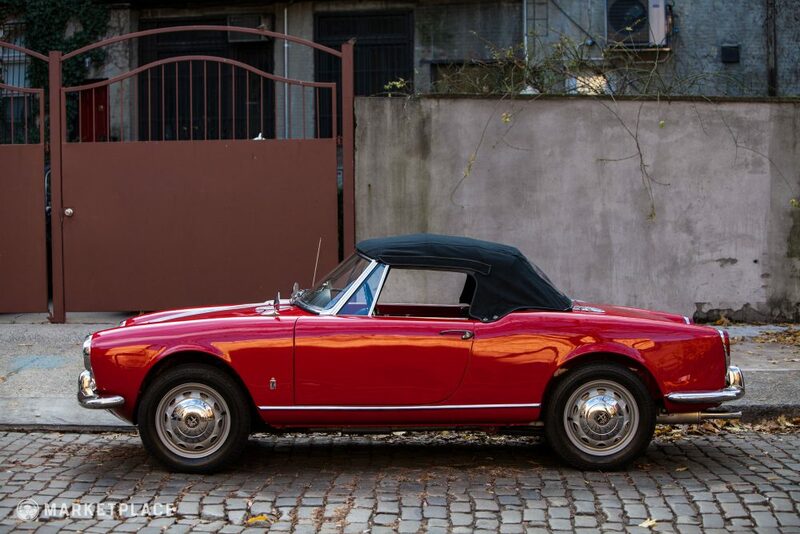 Turning a four-seater platform chassis into a two-seater spider is a serious task, to which Alfa entrusted Pininfarina to execute. 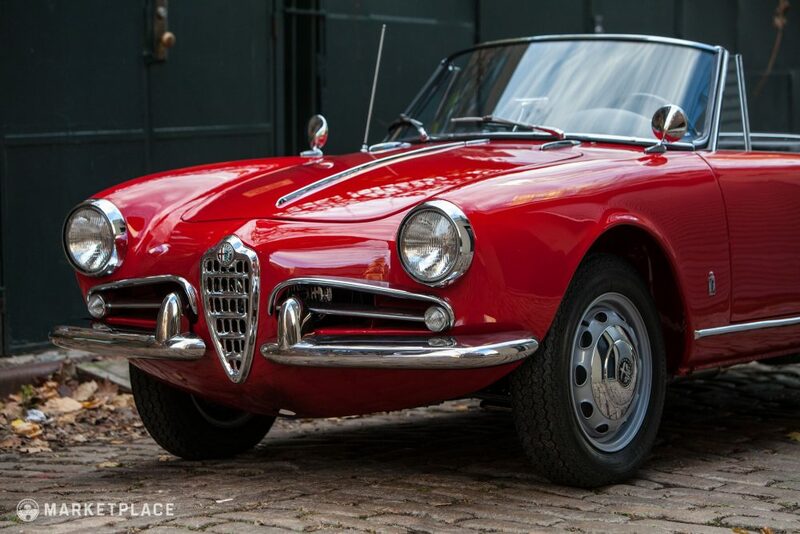 Although at first glance the Giulietta Spider shares many of the Sprint coupe’s characteristics, upon closer inspection significant styling and structural differences are evident. 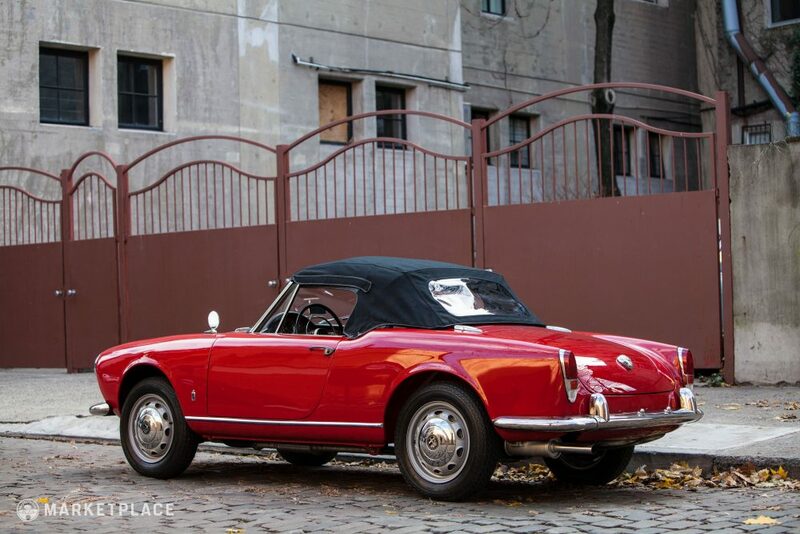 The greatest visual alteration aside from the removal of the roof is the rear quarter hips that hike up just past the rear of the doors—notice the Sprint coupe lacks this athletic aesthetic. The trunk section was extended and the cabin size shrunk. 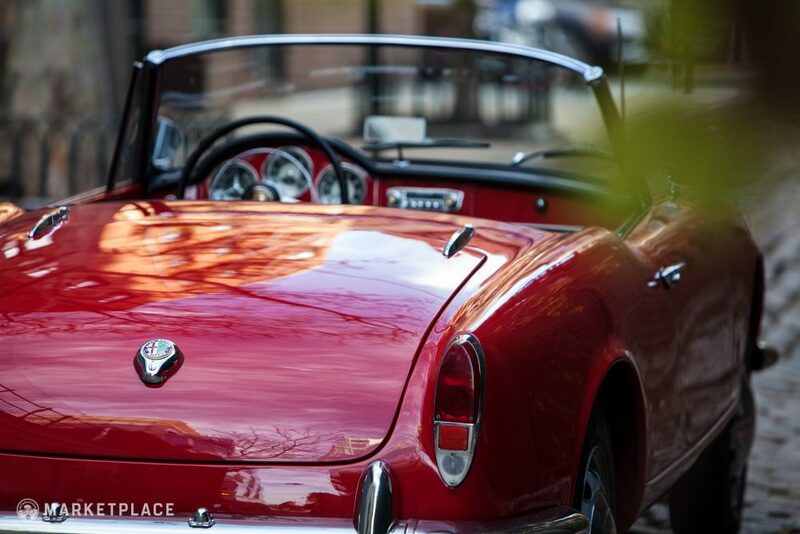 The long boot lid graciously curves down towards the rear, flanked by large hip-to-taillight quarter arches. 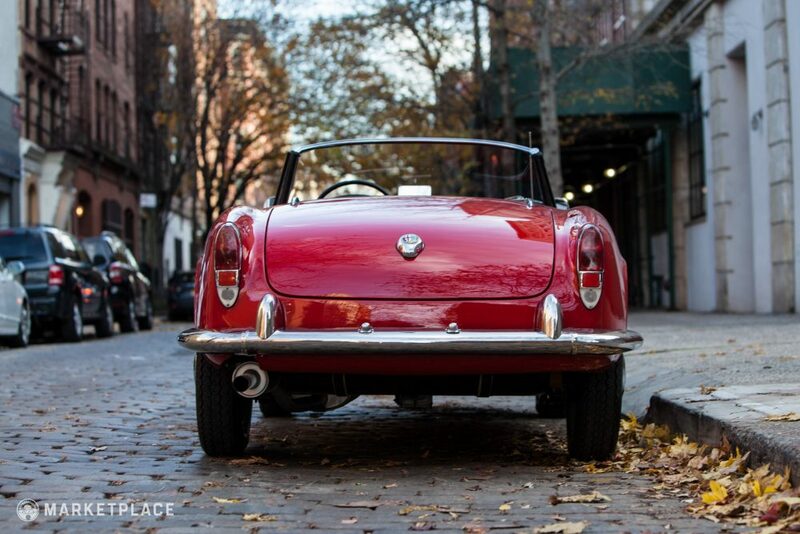 Instead of a single bar front bumper, the Spider received individual bumperettes. 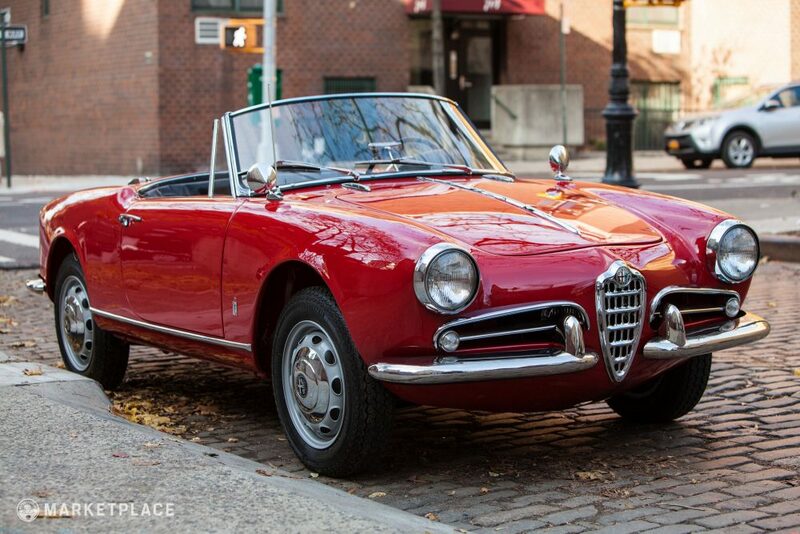 The top-of-the-line Spider Veloce model, literally translating to “fast,” received a unique fresh air scoop embedded in the driver’s side grille section to direct air to the carburetors—this scoop is often added to lower-end Normale versions of the Giulietta Spider to recreate this Veloce characteristic. 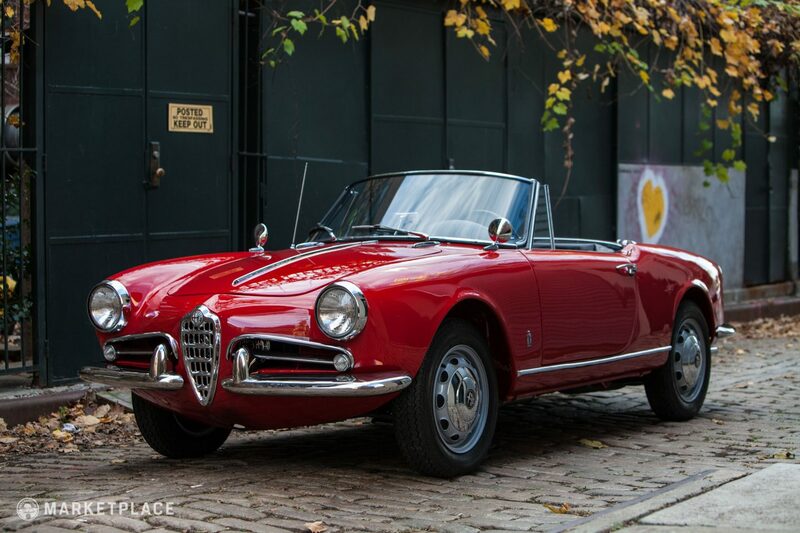 This particular 1962 Alfa Romeo Giulietta Spider Veloce recently underwent a comprehensive no-cost-spared rotisserie restoration in 2016. 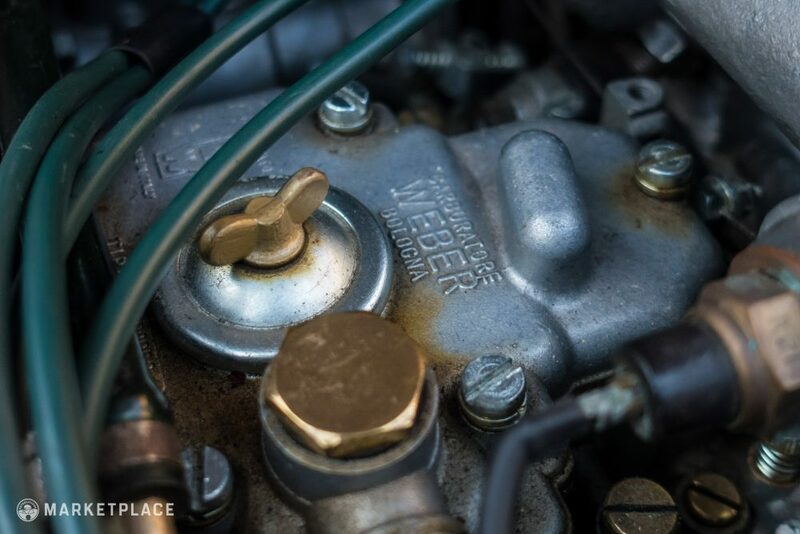 The car is described as “jewelry” with no bolt left unturned during its meticulous resurrection. 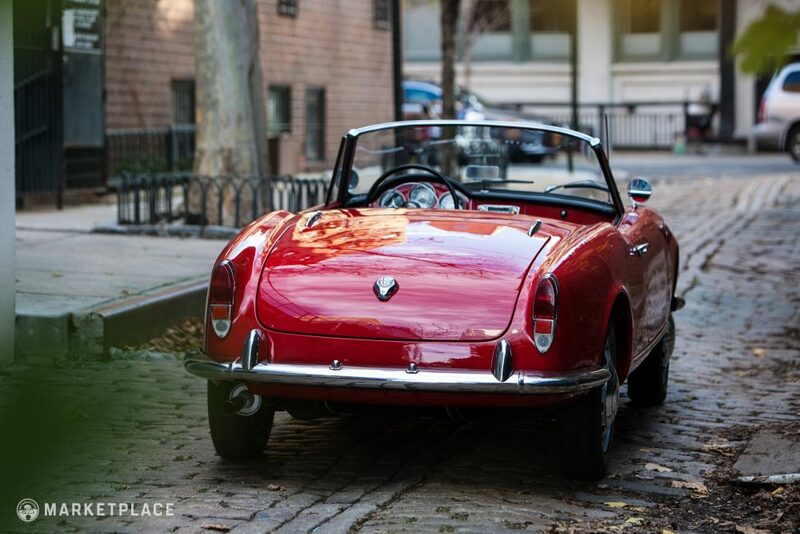 Finished to a standard likely greater than new in 1962, this fully restored and authentic Veloce model Spider was cared for and restored by an avid Florida-based enthusiast. 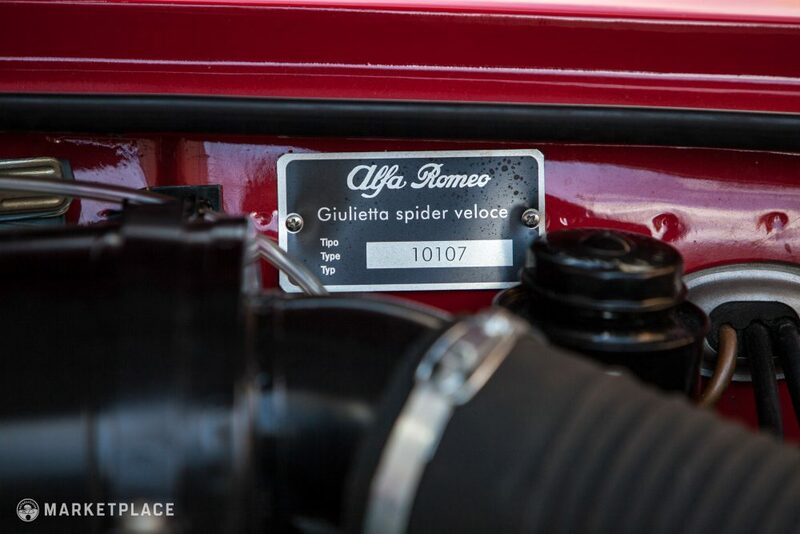 True Veloce models are verified by an “F” designation stamped above the serial number on the firewall, which this car has. 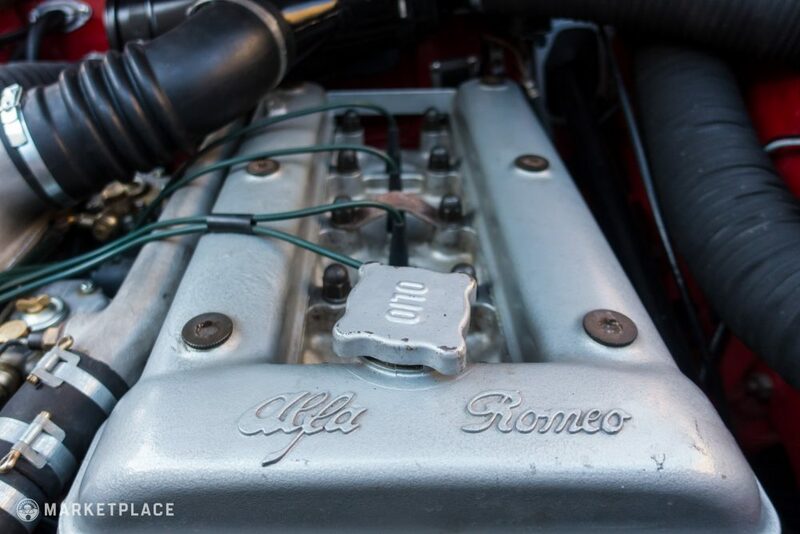 The car also comes with a letter from Marco Fazio of Alfa Romeo in Italy confirming that this is a proper Veloce series. This letter states that the car was originally red, chassis # AR171861, engine series AR00106 manufactured January 19th, 1962. 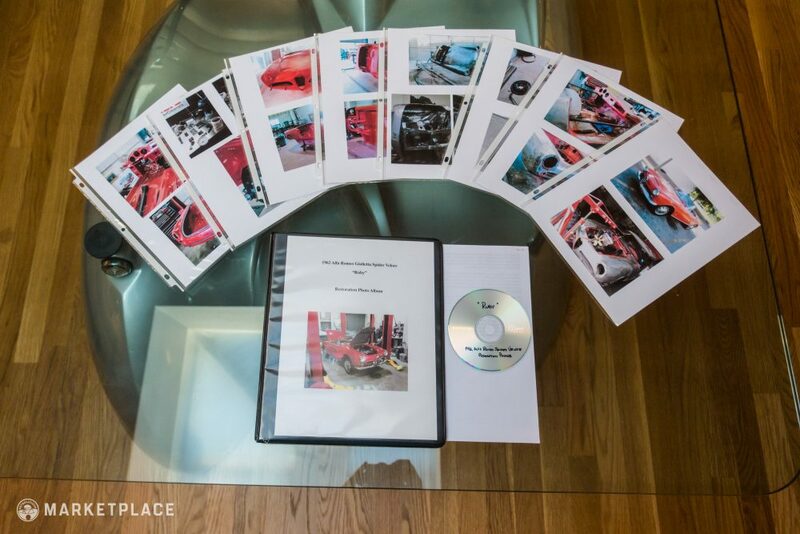 This is the most detailed information that is available, coming directly from Alfa Romeo. Here’s a link to photos of the full restoration. 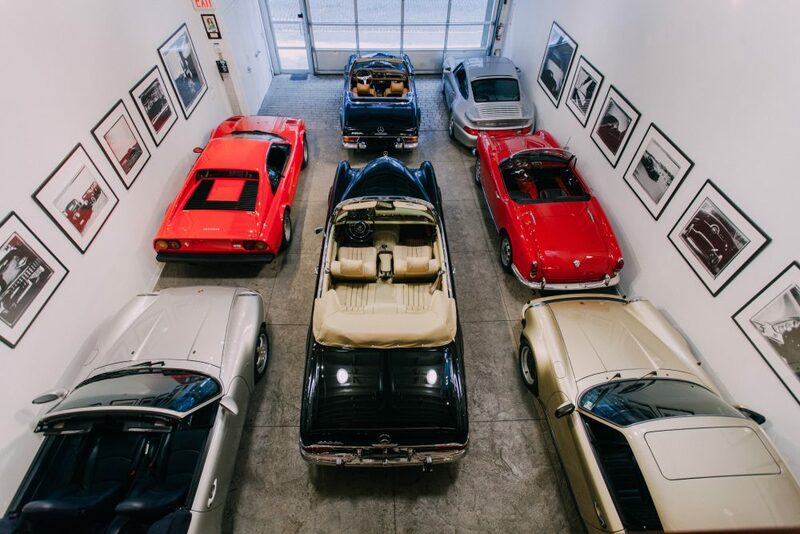 Body – In 2016, Miami-based Alfa and classic Italian specialty shop Auto Veloce Inc conducted the restoration. 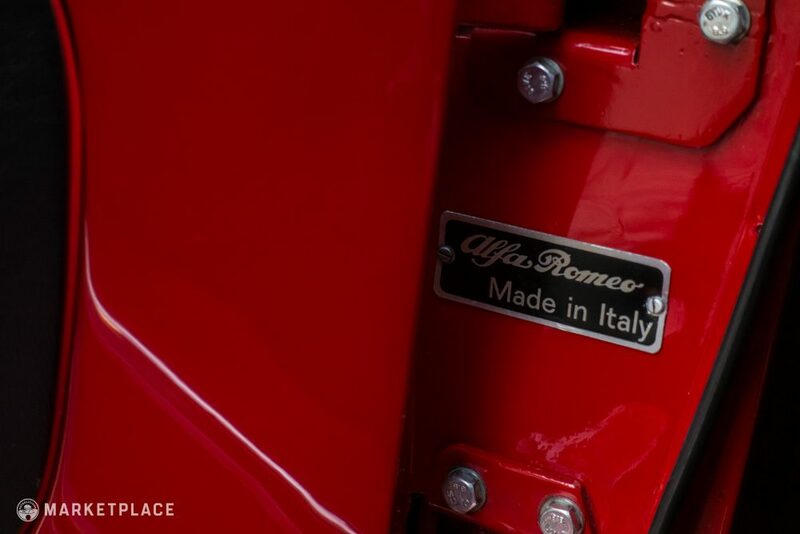 The chassis was completely stripped, prepped, and repainted in its original Rosso Alfa traditional nonmetallic red paint. 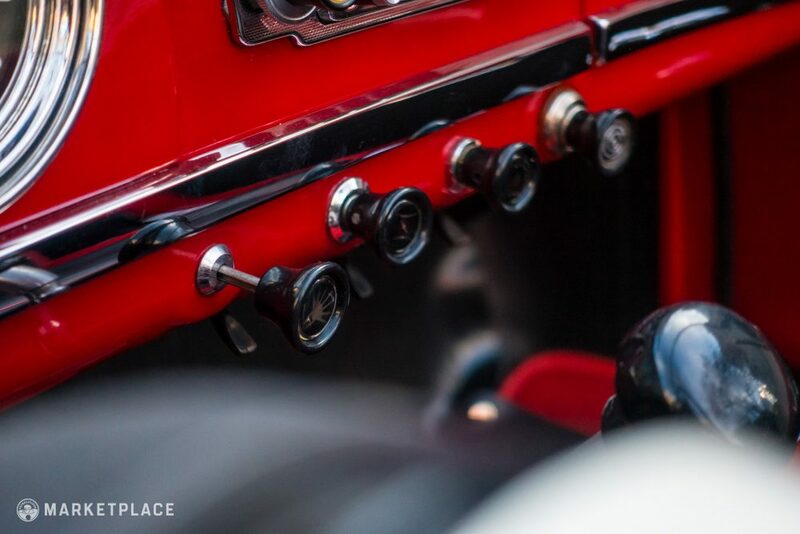 Utilizing only refurbished original pieces or resorting to scarce and highly sought after new-old-stock (NOS) parts, the car was tediously reassembled. 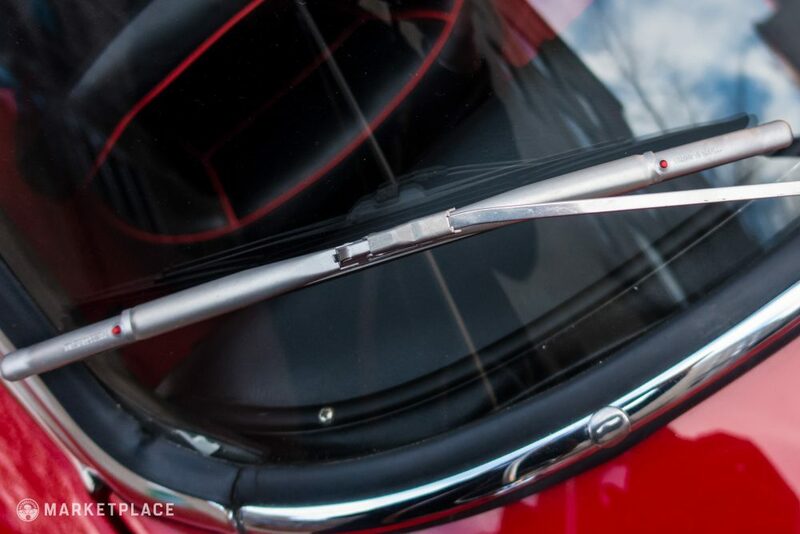 Panel gaps are even throughout the body with no rust or corrosion to note. 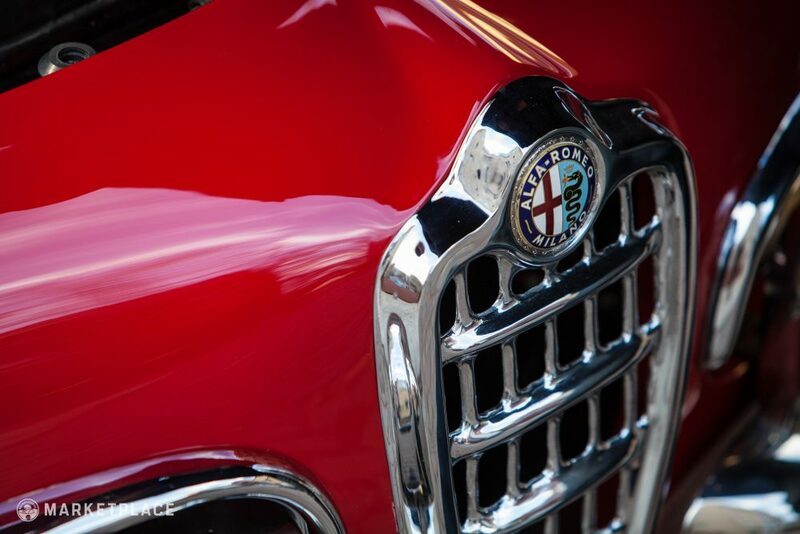 Paint – The car was originally Rosso Alfa, which was selected again for an accurate factory color respray. 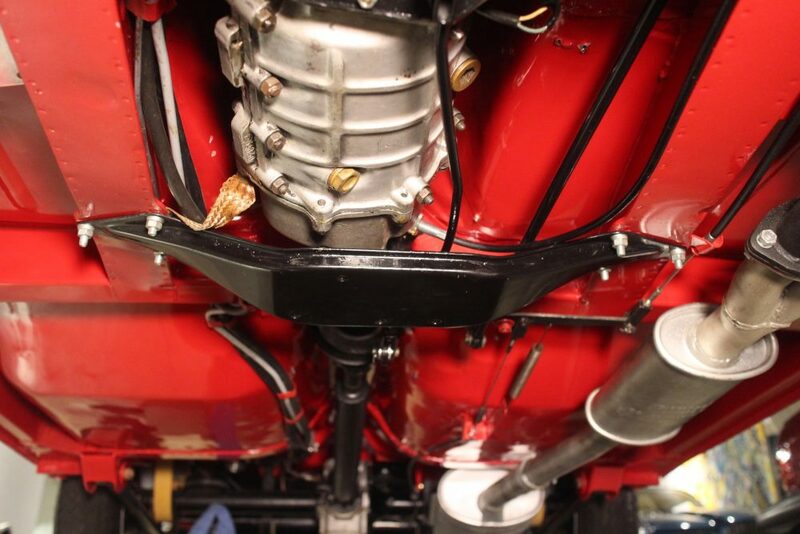 The paint has great depth and shine with no major imperfections—even the undercarriage was resprayed to a high standard. 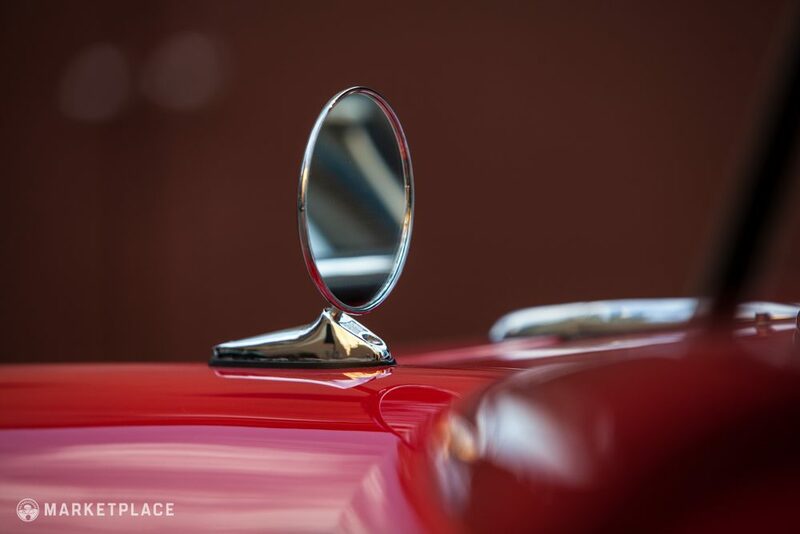 Chrome and Glass – The original windscreen and side glass are all in excellent condition with no etching or pitting, the brightwork trim retains a highly polished finish, and the lighting equipment is fully functional, clear, and undamaged. 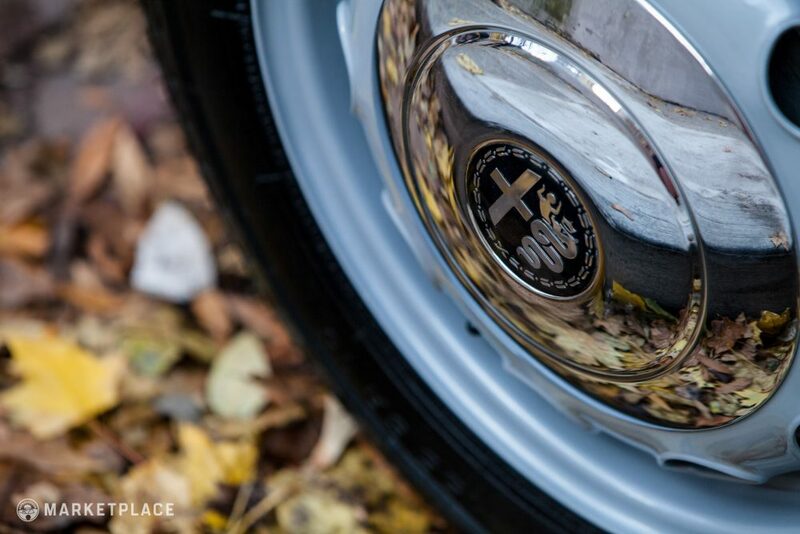 Wheels – The original 14-inch steel wheels wear fresh silver paint as per factory specifications and come complete with four polished authentic Alfa Romeo center caps. 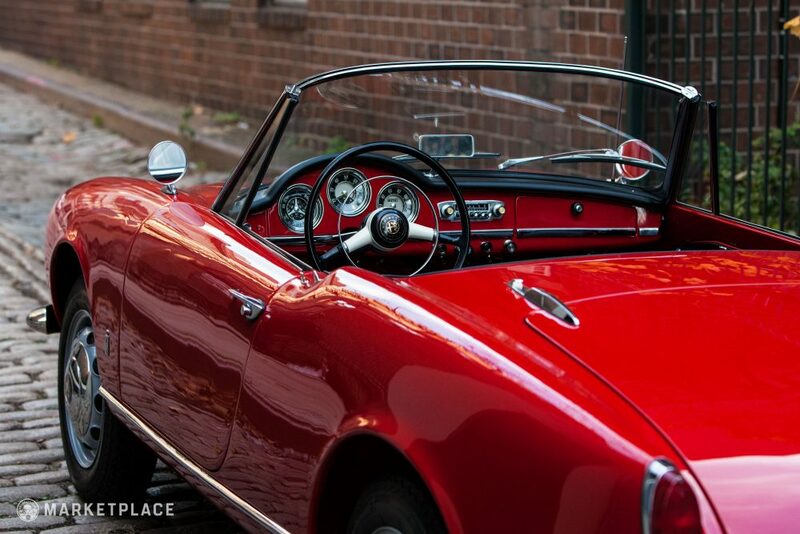 Convertible top – A new folding soft-top canvas roof has been installed with taut fitment when fastened upright and folds neatly behind the two bucket seats. 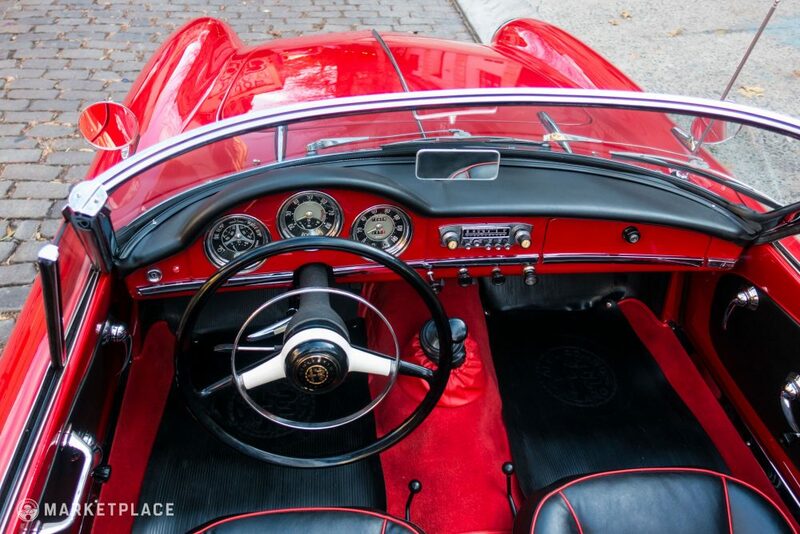 Underside – The underside of this Veloce Spider is in immaculate condition and has no rust or corrosion, a testament to its superior restoration quality. 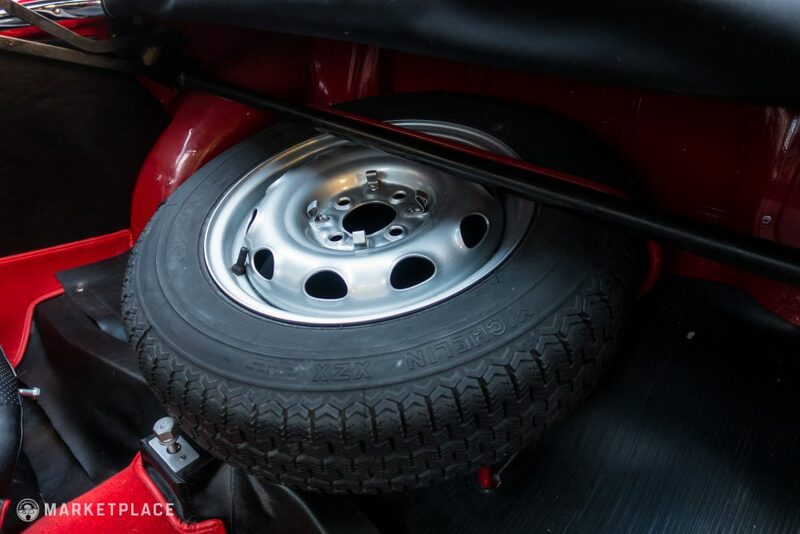 Steering wheel – The correct two-spoke black rim steering wheel is complete with metal hoop horn ring and centerpiece, which is in great condition. 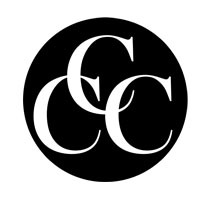 The lettering has some light grazing, which is commonly found and consistent with an original wheel. 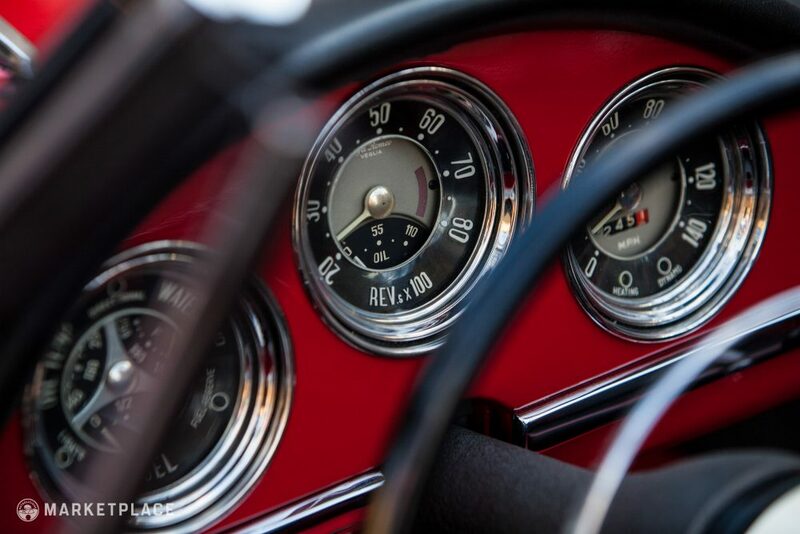 Dashboard & Instrumentation – The original Veglia instruments are clean with clear lenses for effortless diagnostic viewing. 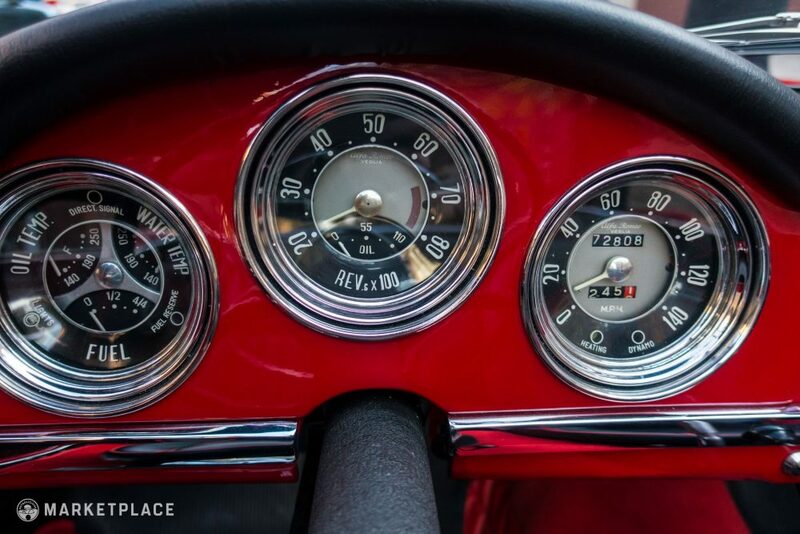 All dials including the three-in-one water pump/oil temp/fuel unit are fully functioning. 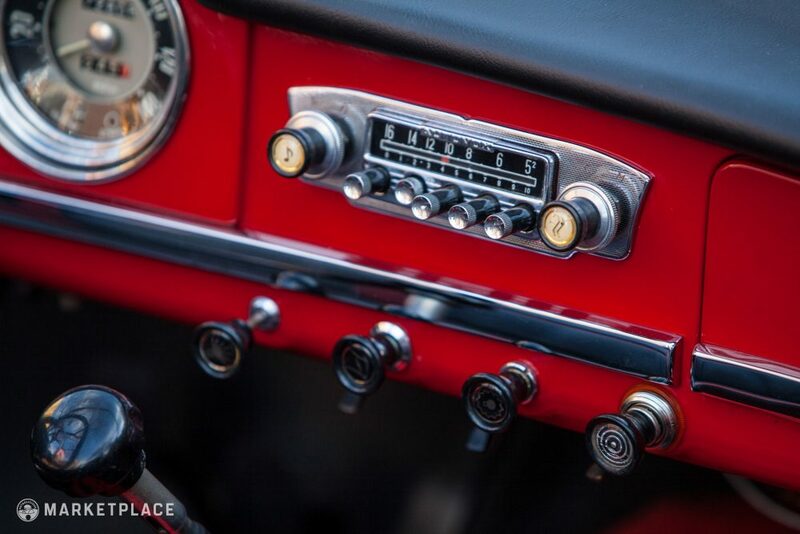 The dash top has been reupholstered in black vinyl with no creases or tears. 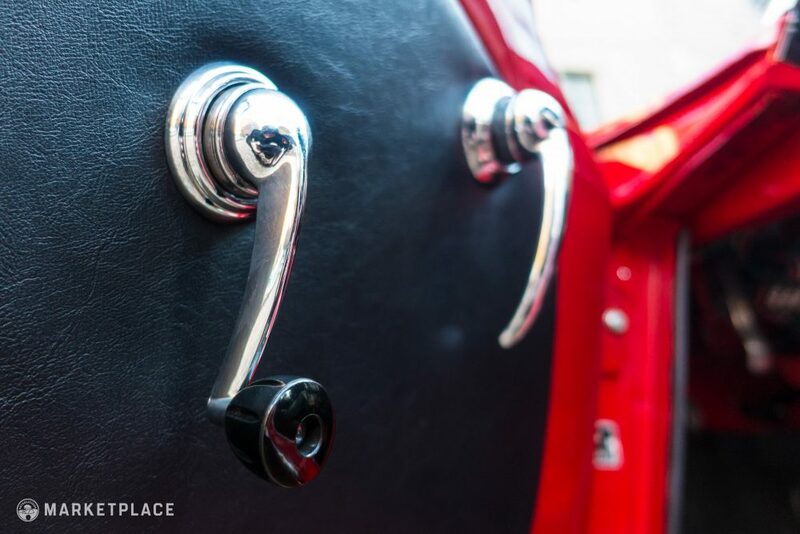 The metal dash section wears matching Rosso Alfa paint with no scratches and is complete with authentic NOS Alfa switchgear and the original radio is still in place. 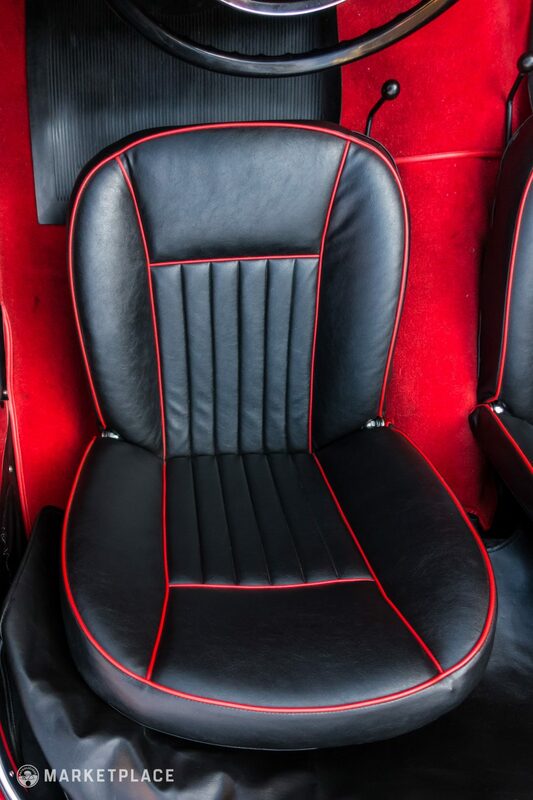 Seats, Trim & Carpet – The floor has been fitted with new carpeting and the seats wear new black vinyl seat covers with correct red piping as originally spec’d from the factory with matching vinyl door panels complete with door pulls, handle, and window reels. 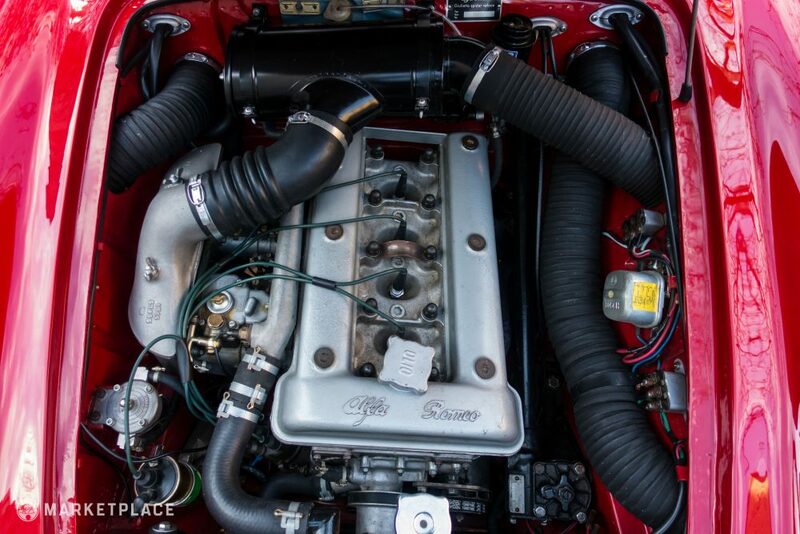 Engine – The Veloce model received the twin-cam 1.3-liter dual Weber carbureted inline four-cylinder that’s stuffed with 9.7 to 1 high-compression pistons mated to forged rods, in addition to fatter camshafts, more powerful oil pump, BOSCH distributor, and steel headers for a small but potent power plant good for around 90 horsepower. 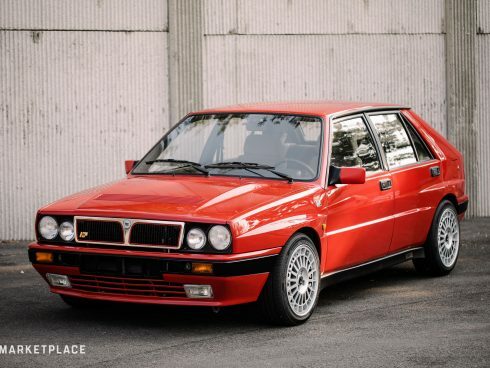 This example retains the factory 1.3L spec which is desirable considering many have been ditched in favor of later model 1.6L units. The original engine was rebuilt during its recent restoration. 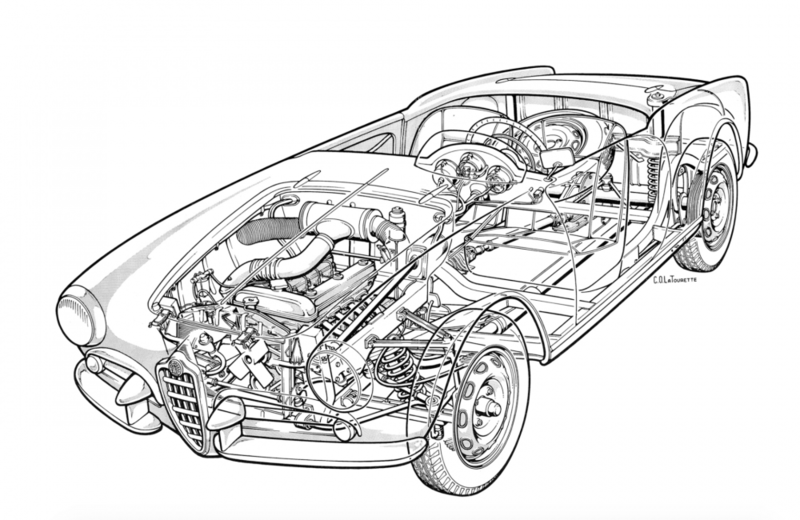 Original Motor: Yes, correct engine/chassis ranges. 2016 Restoration: Exhaust replaced with new full stainless steel system. 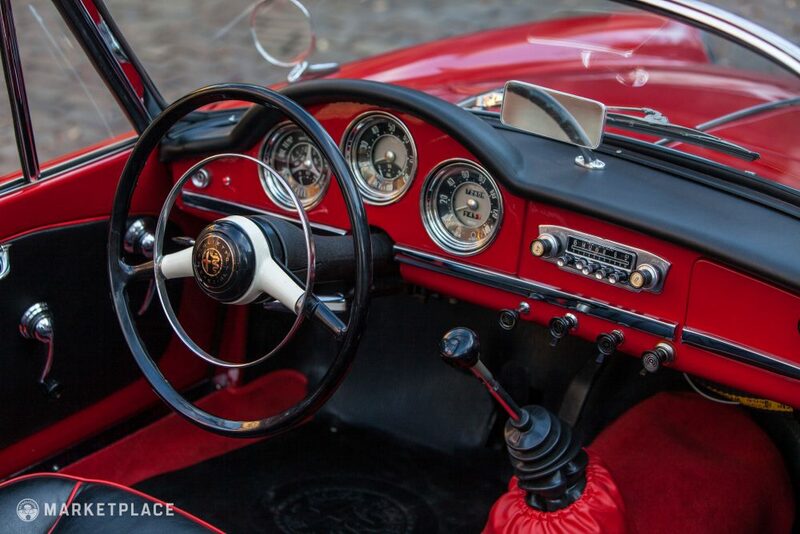 The Drive: The car fires, idles, and climbs through the revs without hesitation. 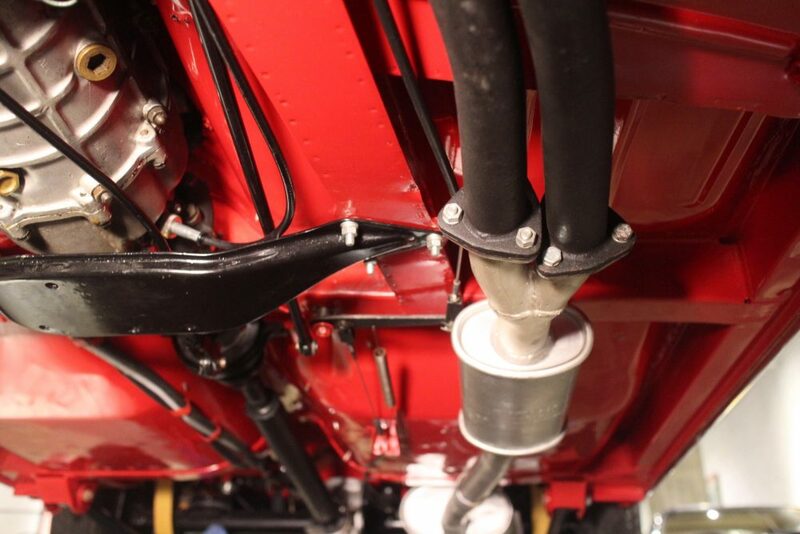 There are no leaks or cut corners in the engine and mechanical rebuild. 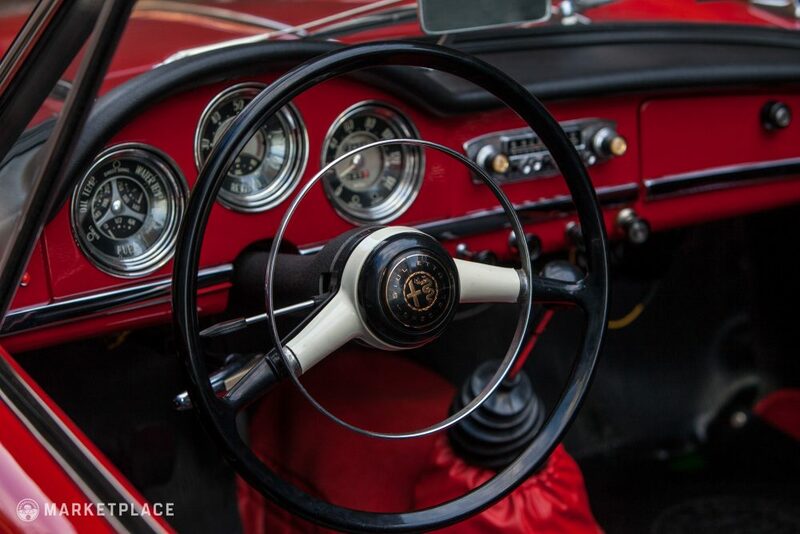 Transmission – The original four-speed gearbox has been rebuilt. The Drive: The original rebuilt transmission shifts smoothly with no pop-out issues or synchro grinds—no grinds in reverse either. 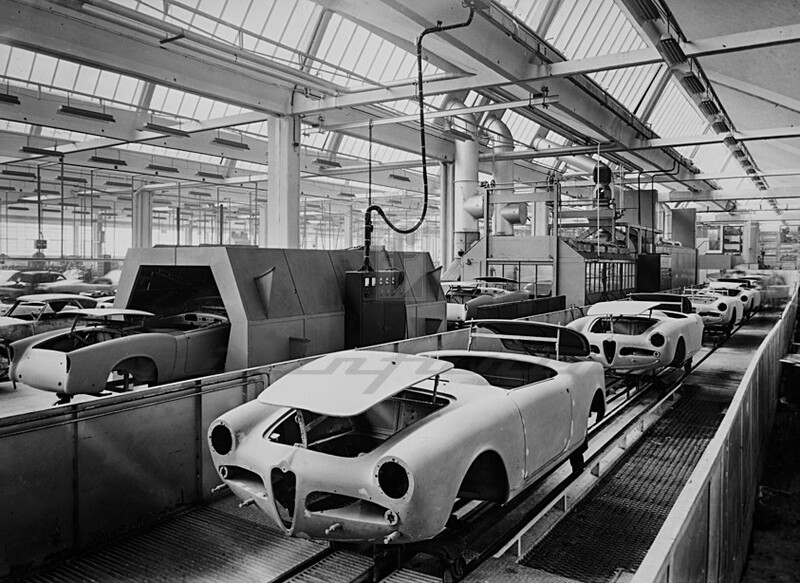 Handling – All Giulietta models, including the Spider variants, were fitted with front independent control arm suspension and rear solid axle suspension with coil springs and hydraulic dampers at all four. Drum brakes were standard. 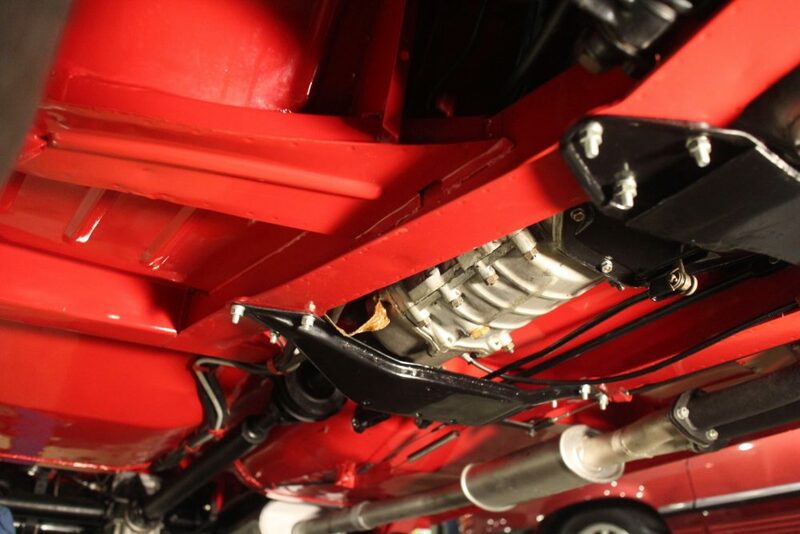 The entire drivetrain has been fully serviced to include rebuilt brakes with new components, all new suspension bushings, struts, and springs. 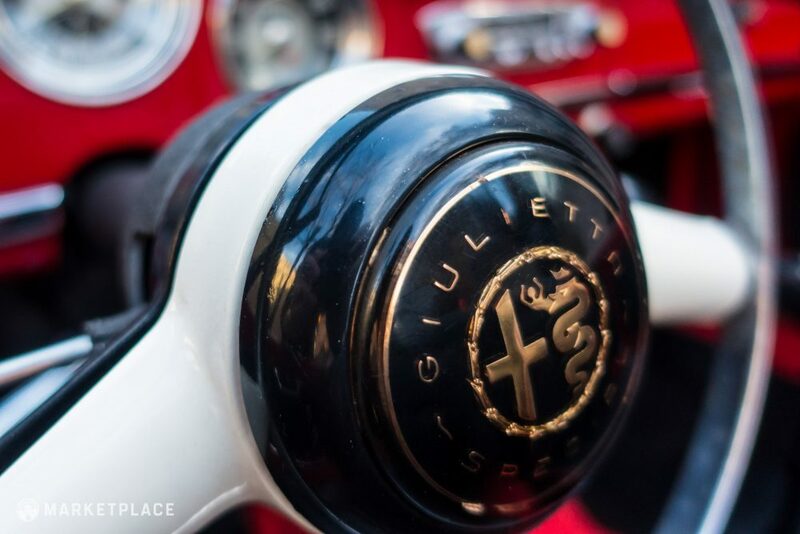 The Drive: This car handles as a Giulietta should – tight and quick. 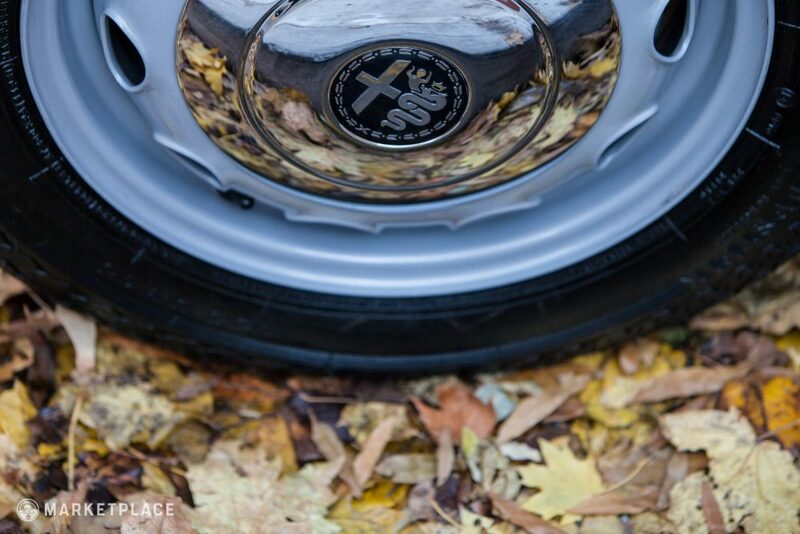 While not discs, the drum brakes give intuitive feedback for safe use and spirited driving. 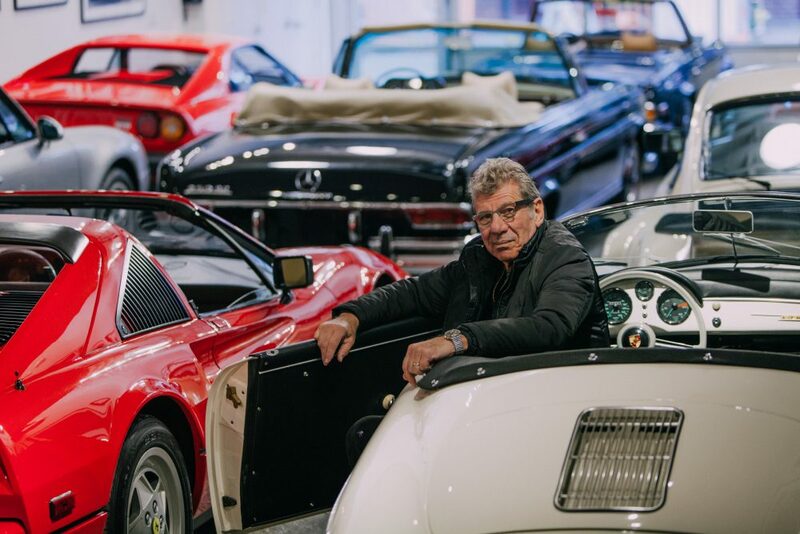 Although the history of this Spider Veloce is vague, the restoration completed in 2016 maintained period correct specifications both aesthetically and mechanically. 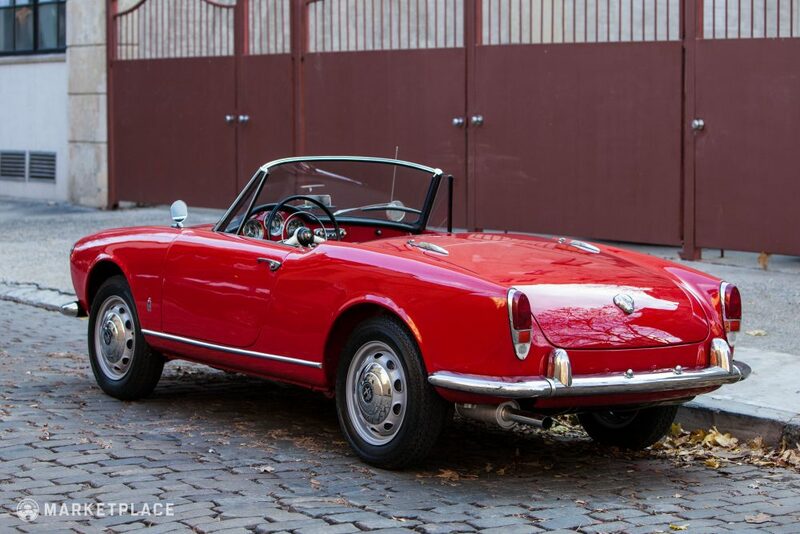 Gooding Amelia Island 2016: 1958 Spider Veloce – $148,000 – Restored, numbers matching example. 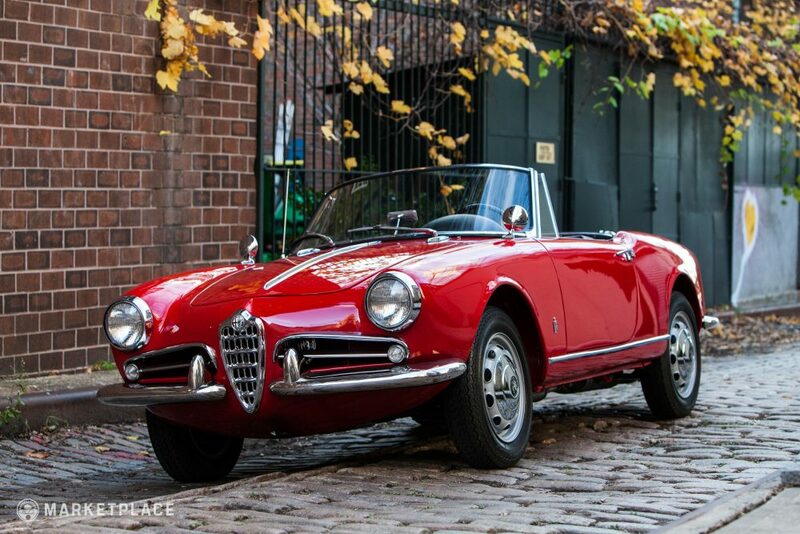 Genuine Veloce: There were far more Giulietta Spider Normale versions made, many of which have been converted to ‘Abnormale’ to mimic the premium Veloce model (only about 2,800 were made). 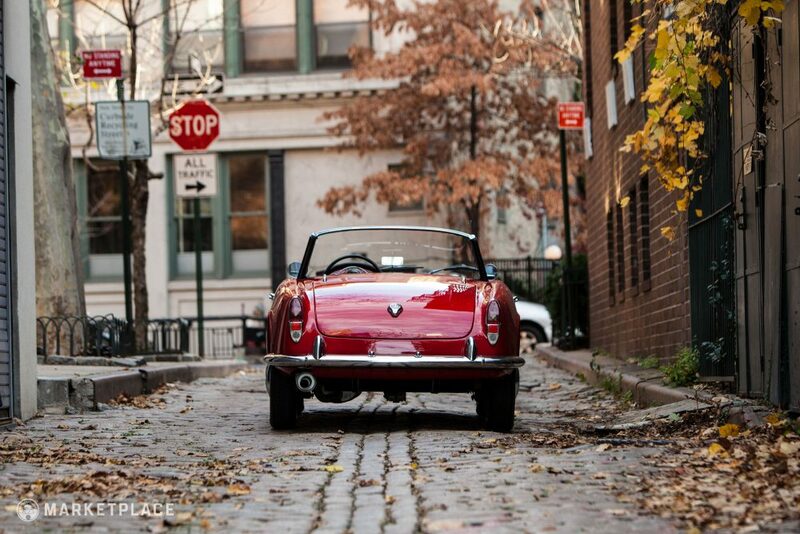 By some accounts, there could be under 100 genuine Veloce Spiders remaining in the United States. 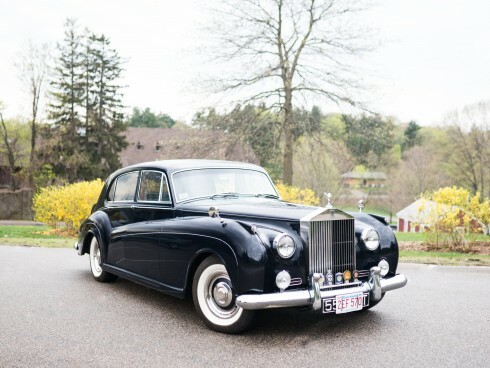 Already Restored: It’s well known buying an unrestored example can be a complicated financial decision, and it’s almost always better to buy one that’s already been restored – particularly to this degree. 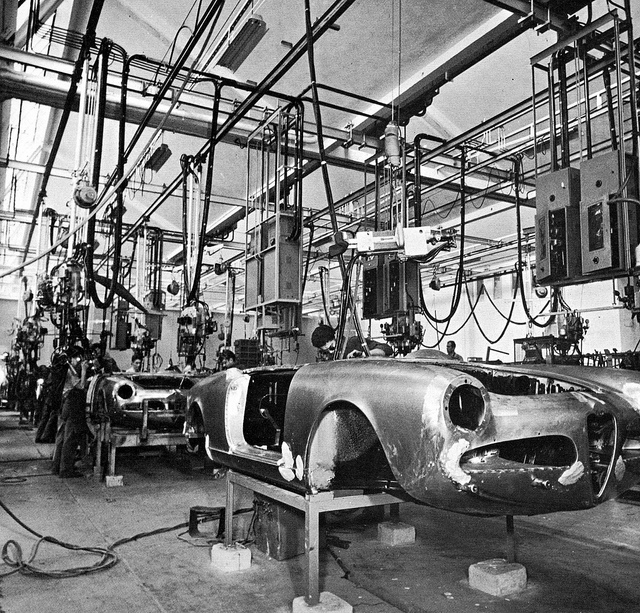 Short Wheel Base: The 1962 model retains the shorter wheelbase of the 750 but the desirable components of the 101 series cars. 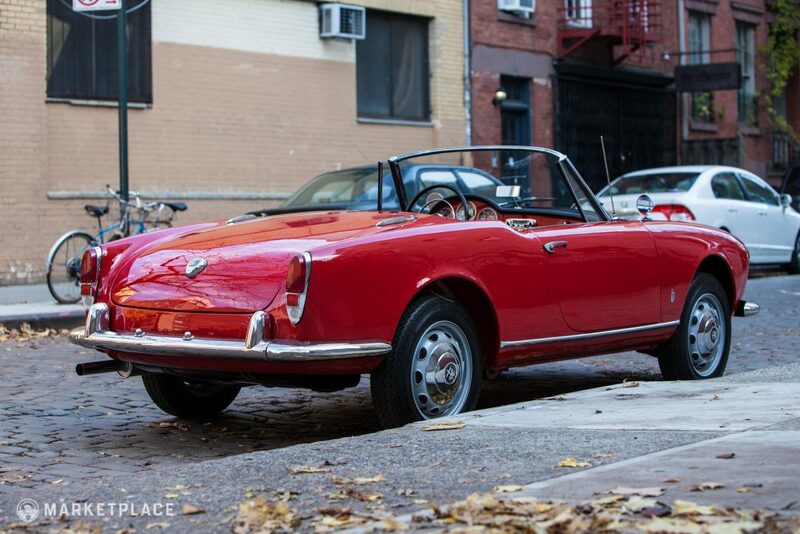 Pininfarina’s Pen: One of Pininfarina’s greatest entries, the Giulietta Spider is one of those standout cars that captures spirit of the era and the essence of postwar design.